New kid on the breakfast block. How many times have you stared at a doughnut, bacon and eggs and bemoaned the fact that the three items weren’t all together in some kind of stack situation you could put in your mouth in the morning? Rest your worried head, dear readers, on the squishy glazed pillow of Dunkin’ Donuts new doughnut breakfast sandwich, rolling out nationwide this week. 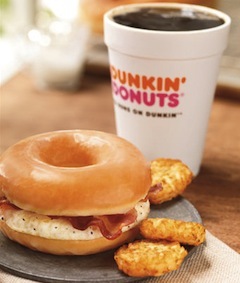 The eggs are fried, the bacon is bacon, and the doughnut is all shiny with sugar, notes the Associated Press. It’s going to become part of the permanent menu as of June 7, timed to what the chain claims is National Donut Day. Thus far the dough/meat/egg combo has just been tested in Massachusetts, but now it’s hitting the big time across the country. And lest you were tempted to imagine the calorie count for this bit of breakfast delight might be shooting off into heights unknown, Dunkin’ says it’s only 360 calories per sandwich, 30 calories fewer than its turkey sausage sandwich. If glazed doughnuts aren’t your thing, Stan Frankenthaler, executive chef and vice president of product innovation at Dunkin’ Donuts, says customers will probably be able to play with the sandwich, switching out the original offering for say, a pink-frosted doughnut with sprinkles. “I’m sure the store will do that for you,” he said.